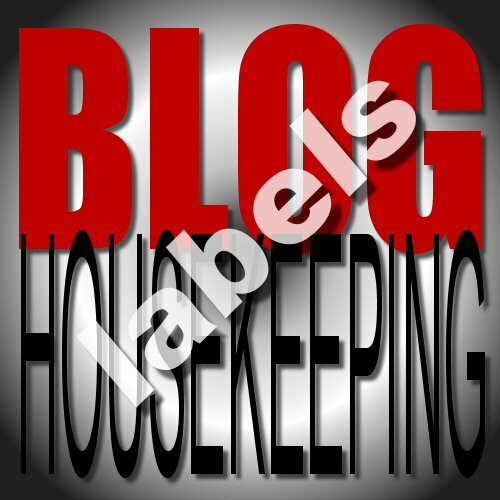 A couple of years ago — around the time of my one year blog anniversary — I set out to do what I like to call some "blog housekeeping". The activity entailed going through old blog posts and checking for bad links, adding new links, reducing the number of tags, creating some search descriptions and finally, adding a couple of "redirects" for pages that I no longer wanted to have available for general consumption. It's something that I do every so often. 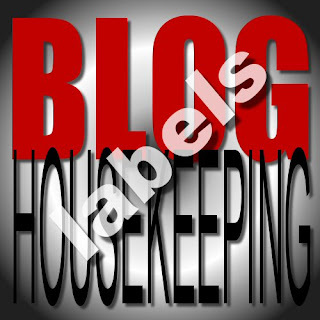 As part of my "Techspertise" series of posts, I thought it would be useful to document some of these housekeeping tasks. In part one, I want to focus on how labels can help organize your blog posts and make your content easier for readers to find. When you're just starting out, labels may not have much impact or relevance. (And some blogs are just naturally easier to create labels for than others. Easy example: a food blog can have labels such as healthy eating, low calorie, cookies, salads... you get the drift.) 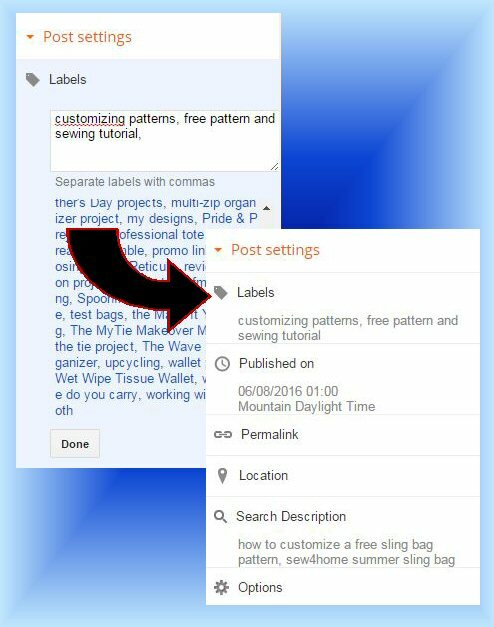 After you've been blogging for a while, however, you should be able to tag your posts with labels that make it easier for visitors to find specific content. Basic guideline for label creation? Whether single words or phrases, keep labels general enough to be applied to several posts but not so general as to apply to many or all of your posts. Example: if your blog is about quilting, then quilting by itself is probably not a great label. That said, you may have noticed that I have a label for sewing, which seems to go against my own advice since my blog is mostly about sewing. However, I use that label to group posts that deal with the actual process of sewing. The same rationale holds for my "blogging" label. Once you have attached labels to your blog posts — and there is sufficient overlap in that more than one post has been given the same label — give your readers access to those labels via a label gadget that you can add to your blog layout. You have the option to show all of your labels or just some of them by making appropriate selections from the screen shown above. 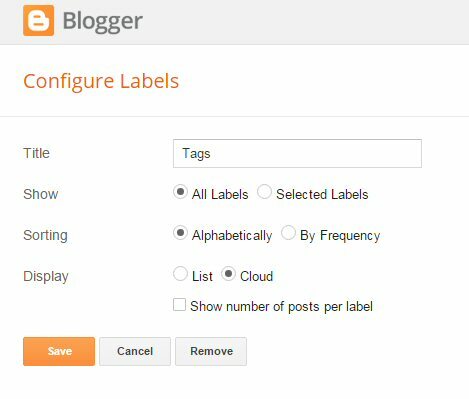 The result is that when a visitor clicks on a specific label, the posts that have been tagged with that label will be filtered out on your blog. In the above, if you click on Father's Day from my tag list, the blog will refresh and show you just the three posts that have been tagged with "Father's Day". Over time, you may wind up with labels that only apply to one post or some that are quite similar. If you find yourself adding new labels all the time and not really re-using any, it's time to rethink your approach and perhaps do some housekeeping. I recently discovered that I had tags for "class review" and "book review" and was about to add "pattern review". I decided instead to lump them all under "reviews". Rather than going into each individual post and making the change, however, I used another method of adding a label to complete this operation. Blogger can do what amounts to a simple find and replace operation for you very quickly. To provide you with an example that I can demonstrate, let's say that I've changed my mind and want my label to be "review" instead of "reviews" with an "s". First, I'll need to list all of my blog posts. Here is an edited version of what you will see when I do that. After clicking on All under Posts and getting all of my blog posts listed, I use the All labels drop down menu (circled above right) to select the label to filter by... "reviews" in this case. Blogger then lists the blog posts that contain the label "reviews"; it indicates there are seven of them. Next, I use the label icon (circled below; it looks like a gift tag) drop down menu to select New label, which opens up a box where I can enter a new label: in this case, "review". Once I click the OK button, the new "review" label is instantly added to those seven selected blog posts. Note that at this moment, those seven posts are still also tagged with "reviews" as well. Therefore, the next step is to get rid of the old "reviews" label. Without leaving this screen, I simply use the label icon drop down menu again, only this time I select "reviews". Because all seven blog posts are still selected (i.e., checked off), whatever I do here will affect all seven posts. Word of caution based on what you see here on this last screen. Any time you want to replace one label with another as I've just done, add the new one first before deleting the old! If you delete first, you will no longer be able to filter out the relevant posts in order to apply the new label. I hope this has been helpful to those of you who may have been struggling with the idea of how to make labels work on your blog. Labels are a great organizational tool. Not only do they make it easier for your readers to find stuff, they're helpful for you too. I can't count how many times I've used my own labels to help me locate stuff from my own posts. That said, if you've been blogging for awhile and haven't checked on the state of your labels, maybe it's time to do so. They could be more haphazard than helpful. Question: how often do you use labels to find specific content on a blog?